Airtight containers are idea for storing baked goods and keeping them fresh. They keep moisture in and unwanted things out. And when I say unwanted things, I include nosy pets that can’t resist trying to taste your cake when your back is turned. Plastic wrap will keep moisture in your baked goods, too, but you can’t beat a good sturdy cake cover for resilience in the face of a hungry dog or cat. The one pictured, incidentally, is a Wilton and it hasn’t let me down yet. Phyllis – That would work, too, although in fairness I’ve heard of people having similar issues with nosy dogs. =) My dog (and my cat, usually) is fortunately very well mannered about people food. What an endearing photo, Nicole. That picture portraits exactly why I have to have a cake cover… My kitty loves everything I make lol Well nothing keeps her from what she wants anyway! 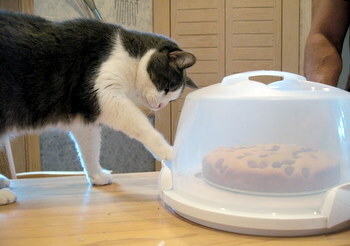 Aw, the kitty likes cake too! They work on husbands too by making him think it is for some pitch-in or maybe for someone who is sick! If I leave cookies on the counter, he’ll eat them, but won’t go to the trouble to open a container for them. My cat is always curious about what we’re eating, so we always have to stick stuff in the microwave or in the oven (yes, we need to buy an airtight container).